Director Ameer seems to have found a script for his second film as a lead. 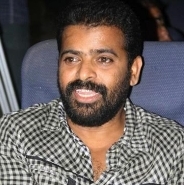 After Yogi, Ameer will be starring in Peranbu Konda Periyorgale, to be directed by Chandran. The movie is produced by one of Ameer's assistants, Adam Baba. Touted to be a political comedy, it will have Mruthiga in the lead. Post Yogi, Ameer's brush with acting continued in the Kanni Theevu Penna item number in Mysskin's Yutham Sei. Peranbu Konda Periyorgale is likely to go on floors in Madurai soon according to production sources.